These sourdough tortillas are chewy, soft, and pliable! Perfect for stuffing with your favorite taco fillings. I even heated them up in a warm skillet on the 2nd day — STILL soft! For even more information and a video demonstration of this recipe, check out our Sourdough eCourse. You can also try the soaked version of these tortillas, which are every bit as yummy! Makes 24 large or 32 small tortillas. In bowl of mixer, combine water, starter, oil, and salt. Mix to incorporate. Keep mixing and adding flour, 1/2 cup at a time until dough cleans sides of bowl and forms ball in center of bowl. Let the machine knead the dough for 2 minutes. Remove dough. Place in a bowl that is oiled with coconut oil or extra virgin olive oil. Rotate the dough around so all sides get coated with the oil. Cover with a damp towel or plastic wrap. Let rest for 12 hours or overnight. The dough will rise, and that is normal. After rest time is over, divide the dough into 32 parts for small tortillas or 24 parts for large tortillas. Roll each part into a ball and put the balls back in the bowl. Cover the bowl again to prevent the dough from drying out. Heat a flat cast iron frying pan over medium heat and add a small amount of oil. Oil a clean, flat work surface, such as a countertop. With an oiled rolling pin, roll out one ball of dough into a circle that is approximately 1/8″ thick, or your desired thickness. Place rolled out tortilla in the pan. Let it cook for about 25 seconds or until there are several bubbles in the tortilla. Flip the tortilla with a spatula and cook the other side for another 15 to 25 seconds, or until the bubbles are browned*. Remove tortilla from pan and place between towels to stay warm and moist. Meanwhile, roll out the next tortilla. Repeat until all of the balls have been rolled out and cooked. Add oil to pan and/or rolling pin as needed. Store in a zipper seal freezer bag in refrigerator or freezer. *Adjust heat or cooking times to account for your stove, pan, or thickness of tortilla. 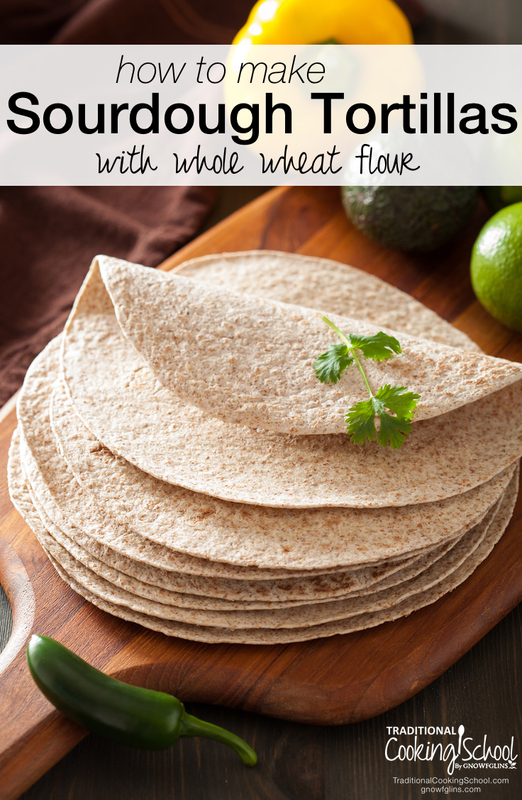 Do you make sourdough tortillas with whole wheat flour? Yum! I have my Great-Grandma Martinez’ tortilla recipe, which is our standby in my kitchen, but I am always on the lookout for more sourdough recipes so will definitely have to try this one out! .-= Sarah´s last blog post… Homemade Pantry Staples =-. .-= Kimi @ The Nourishing Gourmet´s last blog post… Pennywise Platter Thursday 10/21 =-. Another wonderful use for sourdough! I’m glad you shared these. Wardee, do you just have one sourdough starter or do you have multiple? .-= Millie´s last blog post… Antelope Stew =-. Millie – Just the one. I’ve used it with whole wheat and spelt interchangeably. I have a tortilla maker. I wonder how this recipe would work with it. Mel – I’m jealous. 🙂 I want one of those! I think this recipe would work great. The dough is soft and pliable, so I can’t think why it wouldn’t press out well. Some whole grain doughs are tough; this is not. Try it and see! Be sure to let me know! Always lookin for a another way to use my starter. These were great. I did make some after 6 hrs they were good but then today made some and they were even better. Rolled out great, nice and thin (better than my white flour counterparts). The taste was smooth. I was worried they would be to tangy and heavy but they weren’t. Yummy with butter and honey!!! Gonna make more and make chips/crackers to bake out of them. Thanks!!!!! I have found that soft white wheat flour makes a softer more supple tortilla. Have you made these with spelt? I’m thinking one would reduce the water a little bit. I am trying to decide between trying these with spelt or the sprouted spelt tortillas. .-= Rebecca´s last blog post… Book Giveaway: The Irish Heritage Cookbook =-. Rebecca – I haven’t done these with spelt, no. In general, I use less spelt than ww. But, with sourdough, it also depends on if the starter was fed with spelt or not. When I feed my starter with ww, it is thick. When I feed with spelt, it is more thin. So I end up using more spelt if only that is a factor. But if the thickness of the starter is not a factor, then usually, less spelt is required (though the dough seems stickier). Have I totally confused you? You’re a great cook, so I know you can “feel” whether you’ve got a good tortilla dough. If you do spelt, they are going to be more fragile and definitely need a warm-up the second day, or actually, anytime after they’ve cooled. They get harder with spelt. I’ve done regular spelt tortillas and sprouted spelt tortillas, and that’s how those behave. I tried this recipe last week and it was phenomenal!!! Is it OK to let it rise longer – say closer to 24 hours? Does that make it more sour? Susanna – Yes, you can let it go 24 hours. The taste will be more sour. When I make these, I let them rest 24 hours so 100% of the phytic acid will be reduced. They are not too sour for us. I’m glad you enjoyed them! I let them soak/rise for 20 hours and they turned out great – still not too sour for us. I just have to say this is an amazing dough to work with – so easy to roll out! I do use flour for the rolling process (instead of oil) because it works better for me. I multiplied the recipe 1.5x and then used my large cast iron griddle to cook two tortillas at a time, so now we’re set for a couple weeks. (I just freeze them.) Thanks again for posting this recipe! I’m considering taking the plunge with sourdough. I am NOT (yet) a breadmaker. I’ve fiddled with yeast doughs on a couple of occasions, but am definitely not a pro. I’m wondering where you got your sourdough starter, or if you just caught it wild yourself. Any and all helpful hints would be greatly appreciated. I’m slowly working my way, one small step at a time, into traditional cooking. When I look back at the little changes I’ve made over the last year or so, they’re actually starting to add up! I’m no longer intimidated by lacto-fermented veggies. Score! Making homemade yogurt is now a snap. Raw milk and pastured chickens are in the works. My boys love whole grain blender-batter soaked pancakes with pastured eggs for breakfast. I’ve got kombucha “working” on my pantry shelves. Kimber, you are doing fantastic! So many wonderful changes – that’s what its about, a little at a time. Then you look back and can see how far you’ve come. I got my starter from Cultures for Health – the New England sourdough starter. It is versatile and I feed it whatever flour I’m using at the time: spelt, ww pastry, hard red wheat, hard white wheat, rye… Its been going strong for a year. I had tried to catch a wild yeast starter before and failed, so I chose to get an established starter this time. I’m glad I did. But then again, I’d like to try catching my own someday, too. And I probably will. There’s a free starter you can get at: http://carlsfriends.org . It is an Oregon Trail sourdough starter that is very, very old. A bit of history in your kitchen! Donations are accepted, but all that’s required is a self-addressed stamped envelope with your request. Thanks, Wardee. I’ve been to the carlsfriends site before, not sure why I didn’t send for a starter. Duh?! Anyway, I’ll also check out Cultures for Health, and see what’s there. I don’t have a mill, so I’ll be using store bought flour. Do you know if that makes a difference with the sourdough success/failure rate? I know the nutritional benefits of the fresh-milled flour, I’m just wondering if it will affect the sourdough. Anybody?? Today, since my front yard is burgeoning with weeds, my boys & I are going to be adventurous and try making violet jelly and dandelion jelly. I’m off to buy some pectin. Here goes nothing! Halved this to make sure it’d pan out alright (ouch, pun). Did around a 24-hour room-temp ferment (olive oil coat) using WW but used a started I feed with organic white. Refrigerated dough for a bit and rolled out onto parchment paper for ease. When each testale (ball of dough) was rolled out, I just flipped the paper into the pan with some oil and pushed it down with a finger and/or wooden lifter. After about 5 seconds on heat, the paper would release and I could go re-use the sheet for the next tortilla. as a filling and it was fabulous. I started these last night and rolled/cooked them this morning. They turned out great! I halfed the recipe and got 12 large tortillas out of it. I couldn’t believe how easily they rolled out. This is a recipe I’ll be using again. 🙂 Thanks! I know this recipe has been here for awhile, but I was wondering if you recommend soft ww flour or hard ww flour? I have both and I am not sure when to use which one. Thanks for any information you can give. Karena — For these I recommend hard whole wheat. The soft doesn’t roll out as well. These are fabulous and have become a staple in our house! Thanks for the recipe! Hi, tried these and it was a disaster. How does one move them from the rolling bench to the fry pan?? As soon as I tried to lift one it tore or stuck to my well oiled moving instrument, rolling pin, spatula etc. Also when placed hot pan on work bench it cracked my high heat resistant Carron work bench!!! Would butter or ghee work well in place of coconut or olive oil? Wow. Thank you so much for this recipe this sounds so yummy! I’m thinking of trying this recipe, but first, I have a question about the starter. I am new to sourdough, but have been making kombucha in a 2 1/2 gallon continuous brewer for a few years ( LOVE it!). I’m wondering if the kombucha may contaminate my sourdough starter, or vice versa? I have them at opposite ends of my kitchen, but it is a closed room, and they’re only about 20 feet apart. (I have indoor cats so I close the doors when I not home). Your website and recipes are phenomenal, by the way! I have tried several of your recipes and they’re are easy to follow and very good!